Submission deadlines are February 1 (spring) and September 1 (fall). The Oregon English Journal invites articles, research, reports, teaching ideas, point/counterpoint presentations, program descriptions, interviews, letters, debates, satires, original poetry, drama and fiction. Focus on theory, research and teaching practices. Appropriate for all levels, elementary through college. Original poetry, drama and fiction. A forum for open discussion of ideas. Spring issue of OEJ dedicated to a specific theme. *In November 2013, the National Council of Teachers of English recognized Oregon English as the best affiliate journal in the United States. 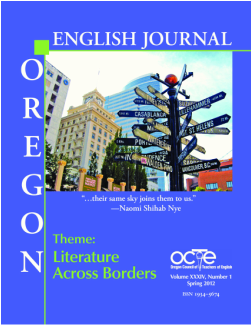 Since 1988, twenty-six issues of Oregon English Journal have been selected by NCTE for national promotion and distribution. Oregon Authors and Their Work, Literary Friendships, Caring about Conventions, Writers on Work and Labor Issues, Lewis and Clark: An Expedition into History, 25th OEJ Anniversary Issue, Dealing with the Realities of War in the Classroom, Whole language, Poetry, Literature of the Americas, Retrospectives on William Stafford, Beverly Cleary and Walt Morey. Varied formats are welcomed, including debates, interviews, position papers, letters, point-counterpoint, satires, classroom ideas, program descriptions, reviews, and original poetry and fiction. Members of the editorial board assess manuscripts in a blind review. Articles are judged primarily for originality of ideas, freshness of approach, pertinence of topics treated, straightforwardness of style and appropriateness to the audience. Selection also depends on usefulness and timeliness for the readers and editorial determination of cohesiveness and overall balance of content in the journal. For questions about punctuation, capitalization and bibliography, consult the MLA Style Manual (Modern Language Association of America). Authors should obtain all necessary permissions for quoted materials. Must be camera-ready on good quality paper in black ink of high carbon content. Photographs should be 5"x7" glossy prints, black and white. Focus should be sharp with clear, well-defined lines. Snapshots rarely reproduce well in print. Return of photographs cannot be guaranteed. Include proper credit lines and clearances for photographs. Concise presentations with interest-capturing titles are valued. No specific manuscript length is required; articles of 1500-2000 words are suggested. 2.) two hard copies (with no author identification on them), double-spaced and titled, with an accompanying separate cover sheet with your name, address, e-mail, and a brief, 2-3 sentence biographical sketch, to the address below. The Editor reserves the right to revise all accepted manuscripts for clarity, excessive length and offensive (e.g., sexist) language. Publicity accorded to any particular point of view does not necessarily reflect or imply endorsement by the Council, its officers or members. Two complimentary copies of the issue are sent to the authors. To send manuscripts and correspondence regarding editorial matters, contact Ulrich H. Hardt. Members always receive copies of the OEJ as part of their membership. Not a member? Purchase a copy. Single copy $10, plus $2.99 for shipping.